Is your visit a special occasion or would you like to make it one? 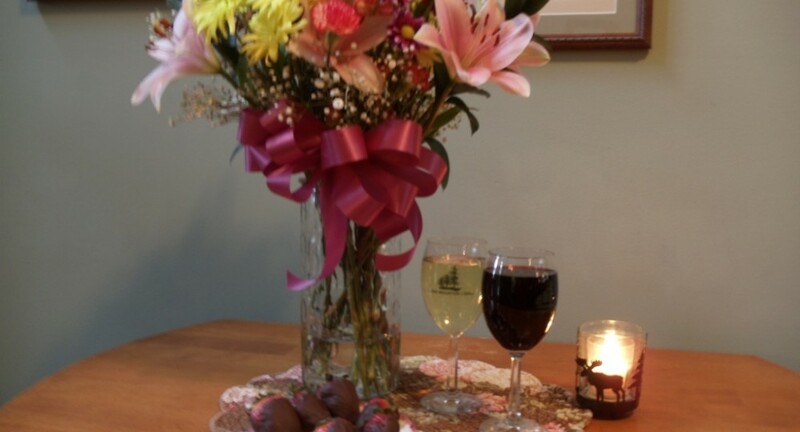 For the that special someone you can have a flower arrangement and chocolate covered strawberries waiting in your room upon arrival, two Long Mountain Lodge wine glasses and a special surprise item of our choice. We make our own chocolate covered strawberries and use locally grown fruit when in season. The package also includes two of our Long Mountain Lodge wine glasses for you to take home as a keepsake. These items can also be ordered separately by asking for them in the comments section of your on-line reservation: flowers at $40, strawberries at $12 and wine glasses at $7.95 each all are plus 7% sales tax. You can also buy the wine glasses in our gift shop.